Do people still read blogs nowadays? I think not much people do so (unless they wanted to search for new food hunting places and travel itinerary) compare to last time and this cause bloggers not to update blog that often as well. That means I got nothing to read and I have no idea what should I do whenever I'm online, plus I'm not a Facebook-kind of people, so how? I'll try to keep my space active though no one will even care about it, but I feel good to read through my old posts especially those photos. Okay, way out of topic. I've been to newly opened Ssambap Korean Restaurant which located at Krystal Point together with BenDan's friends, that's a birthday dinner for BenDan. If not mistaken, we tried to make a reservation before we head there as we knew there will be a huge crowd of diners during dinner hour, too bad no reservation is allowed (maybe it just apply to weekend). We need not wait to get our seats, and not much diners that night like what mentioned by food bloggers, maybe the upsurge is passed. This is the Korean restaurant that provide most banchan, nine in a row including a bowl of salad. All the banchan are quite tasty which feat our taste bud; the staffs never offer to get our empty plates refilled, we need to ask for that which I feel quite troublesome as most of the staffs were hook up with other job like taking order, helping diners to grill the meats bla bla bla. Sometimes they just ignore us when we ask to refill the banchan, but remember it is really okay to refill the banchan here. Each stew or soup is including one bowl of steamed rice, you can add-on the steamed rice which rated at RM3. 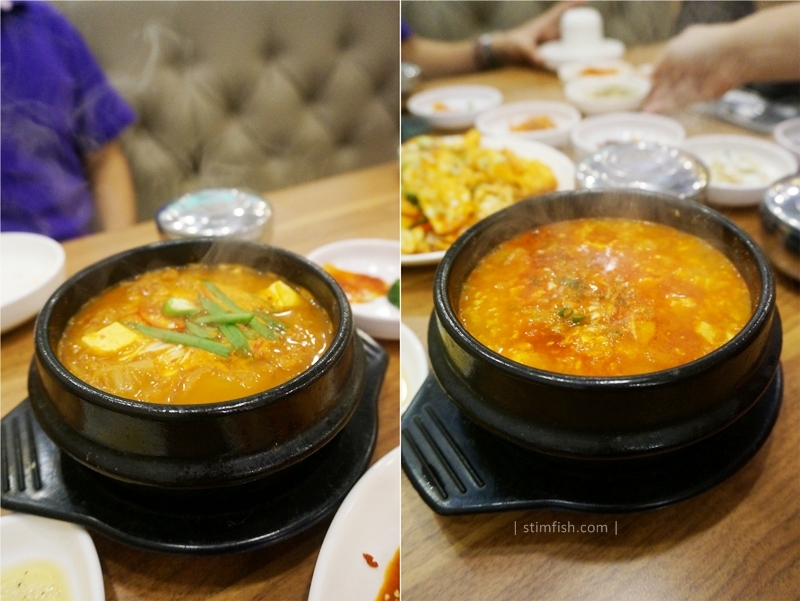 BenDan always prefer sundubu jjigae (aka soft tofu stew) than kimchi jjigae because it wouldn't too spicy and sour; egg and seafood added in sundubu and make it taste so fresh, we finished the whole bowl of sundubu jjigae that night. Yet only kimchi jjigae has glass noodles in it, so we quite struggle what to order sometimes, so we had two different stews that night to share around; both tasted okay, still have room to improve anyway. This is heavenly good when you eat this when it is still warm, the tteokbokki (aka rice cake) is well cook, not too soft and not too hard, which I quite like it. They served this with one hard boil egg where some other restaurants didn't have it, the fish cake that cooked together is good as well, so tasty that I wanted more of the fish cake than the rice cake, oops. Like always, we must order minimum 2 sets for the barbeque, steamed egg is available as well and refillable at RM5. Other than steamed egg, the staffs will also grilled the kimchi and garlic where you can eat together with the meats and wrap in the green. The chicken bulgogi is quite good but the pork belly is over grilled which make it too hard to chew. The steamed egg is quite mild, so we didn't refill it at the end. Overall it's quite good and they have lunch special promotion for weekday, you can get 1 barbeque, banchan, rice, soup and drink that only cost RM19.90! 1-1-24, Krystal Point, Jalan Tun Dr. Awang, 11900 Bayan Lepas, Penang. Watched 'The Intern', it's quite a good movie. Experience never gets old.